Summit Christian Academy (SCA) recently hosted elected officials and local stakeholders for its second annual Legislative Breakfast. CA sixth grade teacher Mrs. Chandra Brownlee and second grade students with Dr. Kevin Washburn. Dr. Washburn recently visits SCA and is the creator of Foundations and Framework and the Executive Director of Clerestory Learning. Summit Christian Academy (SCA) recently hosted Dr. Kevin Washburn, creator of the research-based and research-supported instructional reading program that is utilized at SCA — Foundations and Frameworks (F&F). SCA junior Taylor Richman, senior AuJanai Hawkins, senior Maxyne Davis, and junior Seung Min (Rachel) Lee from South Korea- display South Korean fashion at SCA’s International Experience. SCA International Students recently hosted an International Experience evening for their classmates. Pictured here, SCA sophomore Aliya Finch and junior Glenn Valide-Lewis from France - served crepe chocolate with crepe sucre at the event’s France exhibit. Summit Christian Academy (SCA) International Department and foreign language classes recently hosted an International Experience for the SCA secondary community. 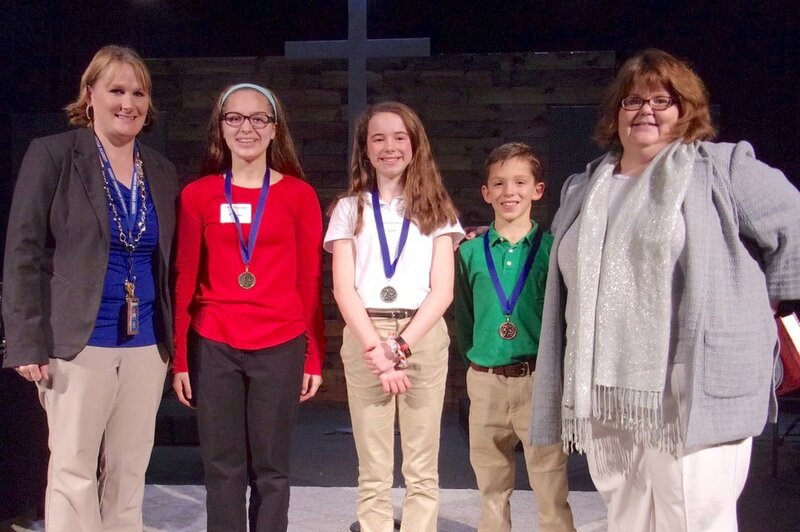 Four SCA students qualified to compete in the Regional ACSI Spelling Bee in Plano, TX in March. Those students include: 8th grade student Olivia Truesdale, 6th grade student Michael Ward, 6th grade student Lucie Epema, and 7th grade student Adrian Haack. Summit Christian Academy has announced its most recent Christian Character award recipients. The purpose of this award is to encourage students to pursue their potential toward attaining the highest level of personal and academic development. Summit Christian Academy has been ranked fifth in the Kansas City Business Journal’s list of Top Area Private Schools. This is SCA’s fifth consecutive year to be ranked in the top five. Photo courtesy Summit Christian Academy.